The Google PageRank formula can be used to model changes to the structure of food webs in an eco-system. Eco-systems often contain many different species which depend on each other in complex ways. Working out how population changes and extinctions affect the food web is difficult. But finding out which species are key predators and prey in these webs is vital if species or eco-systems are to be protected. Try searching Cuil for itself. And some other strange results… neither by popularity nor relevance. 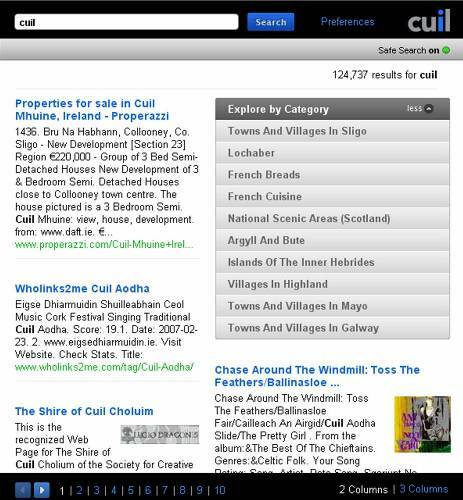 Cuil‘s the new search engine on the block. Cuil claims it searches over 120 billion pages, “three times as many as Google and ten times as many as Microsoft”. Cuil says it uses relevancy, not just popularity. If whatever I did to my PC looked like this, I might know why it doesn’t work. I move the PC less than two miles, no problem; I move the PC less than two feet, argh! All my files trapped. 😦 Back next week! SC Magazine reports that Authorities question alleged New Zealand botmaster. New Zealand authorities are questioning an 18-year-old man who they say is the head of a gang of cybercriminals that infected 1.3 million computers worldwide and crashed servers at a U.S. university last year. Discussion and research continues on how to make digital archives available into the distant future. Meanwhile “old technology” still has much to offer. Paper, specifically acid-free paper, can last for hundreds of years. Not quite an eco-symbol in the sense of being environmentally-friendly in material or production, but at least acid-free paper and permanent paper is made to last a very long time, which cuts down on long-term production and maintenance costs.